In a world that can feel too busy or uncaring, sometimes it can be uplifting to have the opportunity to spread a little happiness. This chance came for us when we played Belfast late last year on our Winterland tour. 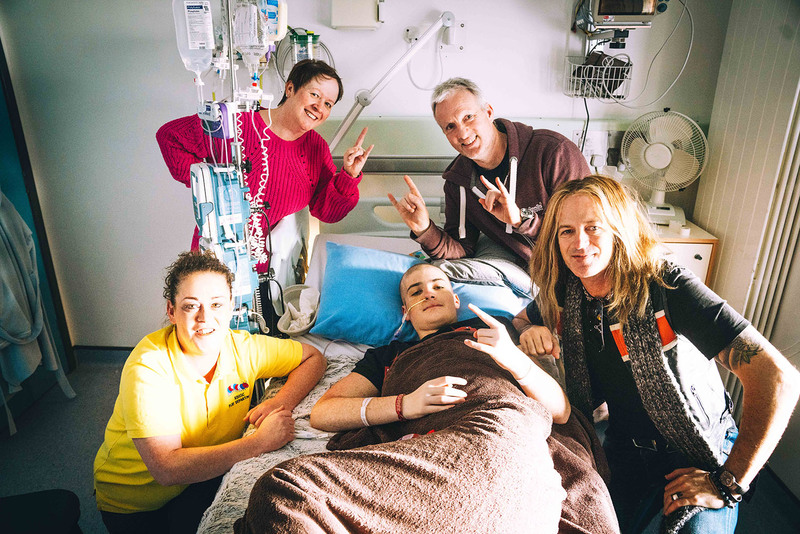 Fifteen year old, Ozzie, is a big rock fan and had hoped to have the opportunity to go and see one of his favourite bands, The Dead Daisies when we came to town. Unfortunately, he was and still is staying at the local children’s hospital, where he is being treated for cancer. Ozzie’s Dad Simon, had contacted us a few weeks ahead of the show to ask if it was possible to come down at soundcheck to have some items signed for Ozzie. Doug volunteered to go to the hospital to visit him before the gig. At the last-minute though, Ozzie suddenly had to have an operation, which he really needed, so we did a video message for him for when he came out of recovery. As luck would have it, the next day Doug was able to pay Ozzie a quick visit, before heading off to our next show. I think it would be fair to say he was overwhelmed to meet Doug and it was great to share some positive energy with Ozzie and his family. In association with the band, there has been a charity set up with the UK Children’s Cancer Charity, Clic Sargent. All the money raised from ‘The Guitarwrist’, (jewellery created from Doug’s guitar strings), goes to supporting children like Ozzie. If you would like something different, Daisies related and, like to help to assist Ozzie and other children in the same situation go to: https://theguitarwrist.co.uk/doug-aldrich/ for more info. Check out the site and get some cool jewels, it will definitely assist an important charity and children going through some really tough times.